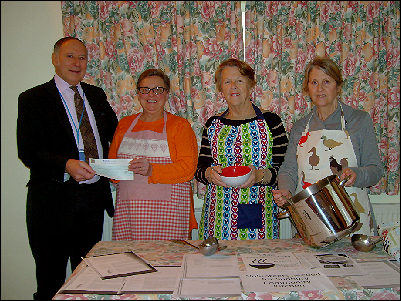 In January 2016, a Community Kitchen was set up. It is run by volunteers, who provide healthy food and company to those in need, alongside information on available help and support. A free three-course meal is offered with a choice of vegetarian menu, including pasta and vegetable bakes, lasagne, curries with rice, chilli with jacket potatoes, as well as soups and salads. Puddings on offer might be fruit crumbles with custard, pastries and fruit salads. There is also fruit on offer on the tables. Guests are served hot drinks, squash and water. Guests are invited to make a donation if appropriate. Up to 35 guests join us for lunch and company every Monday at Suffolk Road Church. To learn more about the Community Kitchen, its activities and how you can get involved, please get in touch using the details on the Contact Us page.